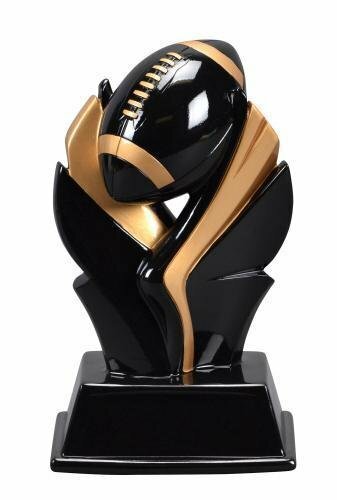 These Football Valkyrie Awards are great choice for next awards banquet. A contemporary design of the classic valkyrie wings is done in gloss black finish with the wings highlighted by gold that holds a football in the middle of the award to complete the look. These Valkyrie sport awards are available in other sports and come in your choice of 3 sizes, 6 1/4", 7 1/4" or 8 1/4" tall. The stylized base provides plenty of room for whatever your personalization needs may be. These are sure to put a smile on any player who gets one.